In the first principle, we explored the mental lens through which we interpret our experiences. The mental universe is our current position in the realms. In this principle, we take a look at the other two realms: The one below the mental realm and the one above. The Mental, the Physical and the Spiritual. The world as we know it exists in three states: The physical realm, which is the world as it is; the mental realm, or the world as we perceive it as described in the first principle; and the spiritual realm, or the world at a higher state of consciousness. This third realm is sometimes also called the subconscious depending on your world view. These three planes are linked. What happens here affects there. What happens there affects here. Knowing here is to know there. Understanding our physical world allows us to understand ourselves and knowing ourselves is to know divinity. This is why science is a key component of occult work. Science gives us the laws and restrictions of our physical world. It also gives us psychology, or a better understanding of our mental lens. Without science, we would lack the fundamental understanding that is required to work in the metaphysical. Often, we think of the multiple realms as an endless succession of parallel universes, vast and infinite. And while the All is indeed infinite, understanding the three realms gives us a more concrete concept of where to aim our work. Imagine your energy work, your spell, as an arrow attempting to shoot through millions of parallel universes. How many will it go through? Will it hit where you need it to? Will it stop before getting to this realm? This stagnant view of the All hinders your spell work by giving you unknowable direction. 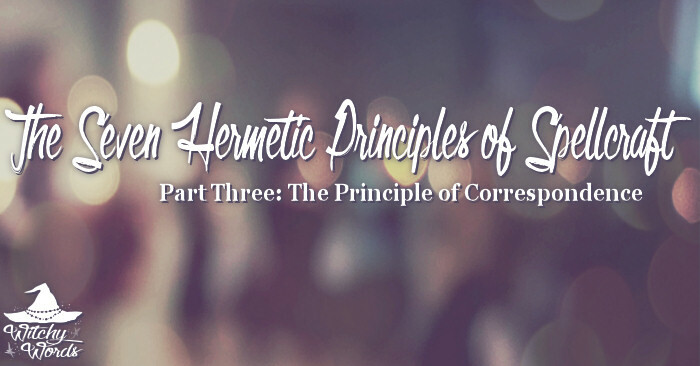 Through this principle, we now have a concise view of the realms. These three connected realms tells us exactly what efforts we need to put forth and how we need to connect them in order to achieve our goals. By using visualization and meditation (mental), energy work (spiritual) and connecting them with tools of the Craft (physical), we can successfully complete our metaphysical endeavors. When reviewing this principle, it may seem that the unknowable mystery of the Craft is lost. We know there are three realms within the context of the occult. What more is there to explore if we name all three? Keep in mind that each realm is vast and we, as humans, are in our infancy of understanding even just a portion of each. We know more about our physical realm than the brain, and that's still very little. So little of even the ocean floor on our own planet has been explored. Our corner of the universe is very tiny and narrow. Our sciences are still being disproved, expanded and advanced. Our understanding of the human brain is even less developed. And our experience in the spiritual? If we're barely learning to walk in the physical world, and we've just started to crawl in the mental, exactly how far could we be on understanding the subconscious, spiritual realm? The higher the plane, the more difficult it is to comprehend it. There is still so much more to do. The universe as we perceive it is a mental construct. This mental lens or plane affects both below - the physical - and above - the spiritual. Through visualization and meditation, we can first create the framework for magic utilizing our mind which then affects both the spiritual and physical planes. As above, so below. When that visualization crosses the boundary into the physical universe, it is still constrained by natural law, by science. As I mentioned in the last article, this constriction could be created by the billions of minds working together to create physical law, or perhaps the physical universe operates on a lower, more restricted version of our mental plane. This has to do with the levels of vibration, which are actually discussed in the next principle. In this principle, we understand that we have three distinct realms that are placed in a specific order: The physical world being on the bottom and the spiritual on top with the mental lens we perceive it all through right in the middle. All other realms are contained within these realms. Parallel universes exist as multiple physical realms. Astral travel and shadow work requires us to access our mental realm. Hedgecrossing ventures into the Other, the world of the dead, which requires us to access our spiritual. When planning a spell, learn to connect all three realms. Utilize mental stimulation, such as visualization or meditation, along with energy or spirit work powered through the spiritual realm and connected to the physical realm with tools such as candles, herbs, jars, satchets, wands, athames and more. Utilizing all three realms helps you aim your spell efficiently. If you want a spell that truly encompasses this specific principle, obtain three small pieces of paper. On the first, write a physical world goal, such as needing a career, money or health. On the second, write a mental goal, such as education or mental health. Finally, on the third, write a spiritual goal, such as connecting with deity or evolving in your Craft. Make them far more specific than what I've listed. Pin these three together by pushing an all-metal pin through the center. These realms are now connected! Burn them to set your intention of achieving these goals.